The Baked Apple Pie Smoothie started on the night of Mother’s Day Eve (that’s a holiday too right?). My husband and eldest son requested that I make brownies for our get-together. Typically, I oblige, but this one time I said no. I had recently decided I wanted to try to eat healthier. Throwing brownies into the mix this early in the game would seem a little counter-productive. 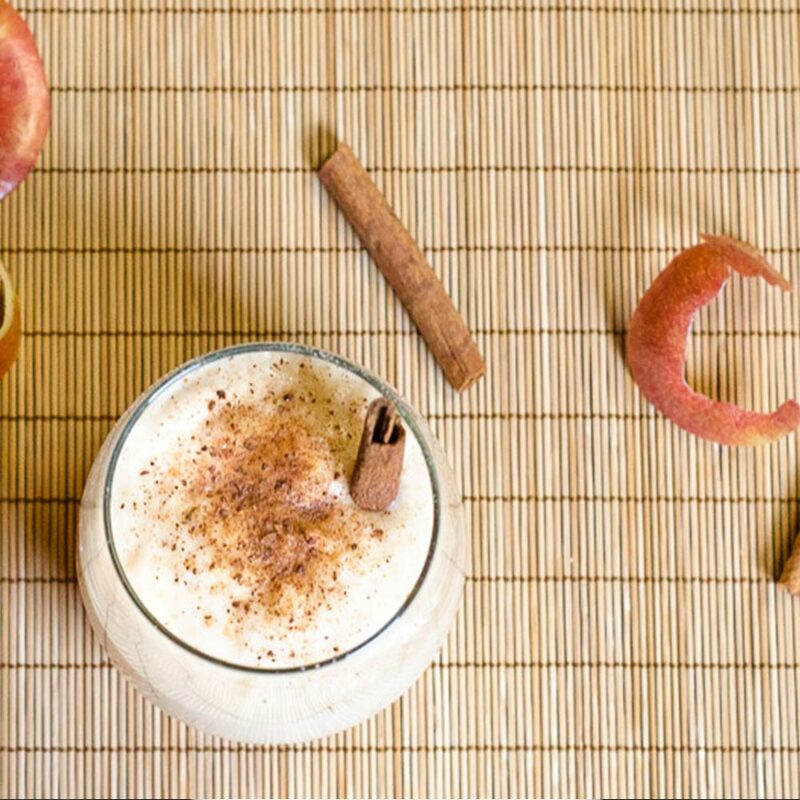 Instead, I challenged my son, Orion, to come up with a healthy recipe involving apples; hence the baked apple pie smoothie. I had just ordered several apples from Peapod’s grocery delivery service. I figured that would be the end of our dessert debate, but 10 minutes later Orion dropped a piece of paper on my lap with his recipe written out, complete with the ingredient list, measured amounts, and directions. I have to admit, I was a bit proud of that moment. 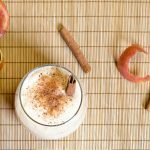 After reading it over, I realized his apple pie smoothie recipe was very doable and not outlandish; even his measurements were pretty close to the actual recipe I’m posting. The recipe is straightforward, healthy, and only uses four ingredients. You can do it with your kitchen elves without that OMG-are-we-done-yet stress that sometimes comes when cooking with wee ones. I wonder if you could sub all the apples in this recipe with cinnamon applesauce and make this even more straightforward. Be sure to let me know if you get to it before I do! Cut and bake your apples. We used the Honeycrisp variety as they are known for being naturally sweet and I don’t have to use added sugar. Feel free to substitute your favorite apples. We tried this first using plain yogurt, but I highly recommend using a flavored yogurt. Once we used vanilla yogurt we were set. Check out these other breakfast recipes. An easy and impressive, kid-friendly recipe that uses only four ingredients and no added sugar. In an oven-safe baking dish, combine the cut apples, cinnamon, and 1/2 cup apple juice. Toss to ensure the apples are coated with both the juice and the cinnamon. Cover the baking dish with aluminum foil and bake for 30-40 minutes, or until apples are tender. Remove from the oven and allow to cool. Then place in the freezer for several hours, if time permits. In your blender, combine the yogurt, apples, and remaining apple juice (half cup) and blend until smooth. Serve chilled with cinnamon and sugar sprinkled on top. Alternatively, try microwaving the apple slices for a few minutes and skip the oven. If you check out Peapod using the link you will get $20 off your first delivery, and I’ll get $10 off my next delivery. Win/Win. Plus, you don’t have to drag your minions to the store. PRICELESS! I use them when my husband is out of town for work. Plus, they double coupons and I can shop at night while watching Game of Thrones.